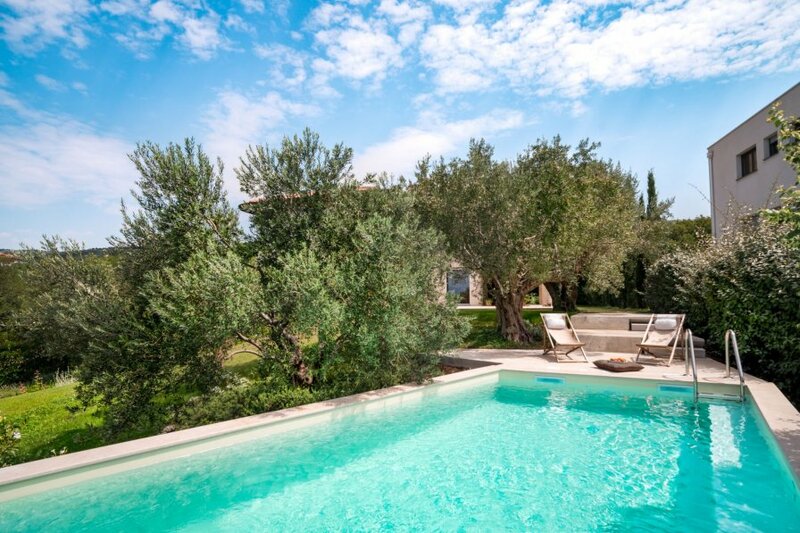 This 3-bedroom villa for up to 8 guests is located in Rijeka and has a private swimming pool. Beautiful villa Kamik, 2 storeys. In the district of Kostrena 5 km from the centre of Rijeka, in a quiet, sunny, elevated position, 200 m from the sea, 200 m from the beach, in the countryside. Private: property 1'300 m2, garden with lawn 800 m2, wildlife garden, swimming pool angular (8 x 4 m, depth 150 cm, 18.05.-12.10.). Outdoor shower, terrace (15 m2), garden furniture. In the house: internet access, central heating system, washing machine. Parking at the house on the premises. Shop 1 km, restaurant 100 m, pebble beach, rocky beach, concrete beach 200 m. Youth groups are not allowed. 4-room villa 270 m2 on 2 levels, south facing position. Beautiful and cosy furnishings: living/dining room 120 m2 with satellite TV (flat screen), air conditioning. Exit to the terrace. Kitchen (oven, dishwasher, 4 ceramic glass hob hotplates, freezer, electric coffee machine). Exit to the terrace. Shower/bidet/WC. Upper floor: (spiral staircase), 1 room 35 m2 with 1 double sofabed (160 cm, length 200 cm), 1 french bed (140 cm, length 200 cm), air conditioning. Exit to the terrace. 1 room 25 m2 with 1 french bed (160 cm, length 200 cm), fan. 1 room 25 m2 with 1 french bed (160 cm, length 200 cm), shower/bidet/WC and air conditioning. Shower/bidet/WC. Terrace 70 m2 partly roofed, terrace 20 m2. Terrace furniture, barbecue (portable), deck chairs. View of the sea and the swimming pool. Facilities: safe, baby cot, hair dryer. Internet (WiFi, free). Garage (2 cars). 1 pet/ dog allowed.